HARRY S. TRUMAN of Independence, Missouri, once remarked that three experiences prepared a man for high political office—farming, banking, and the army. By the time he entered politics he possessed all three. In his preparation for the presidency he might have added three more: knowledge of small-town America, avid reading of books about the leaders and government of the United States, and extensive participation in local and national politics. Brief biographies are Robert H. Ferrell, Harry S. Truman and the Modern American Presidency (Boston, 1983), Roy Jenkins, Truman (New York, 1986), William E. Pemberton, Harry S. Truman: Fair Dealer and Cold Warrior (Boston, 1989), and R. Alton Lee, Harry S. Truman: Where Did the Buck Stop ? (New York, 1991). David McCullough, Truman (New York, 1992), and Alonzo L. Hamby, Man of the People: A Life of Harry S. Truman (New York, 1995), are views of Truman and his times; Robert H. Ferrell, Harry S. Truman: A Life (Columbia, Mo., 1994), focuses on Truman. Richard Lawrence Miller, Truman: The Rise to Power (New York, 1986), stops with the presidency but contains much analysis of the president's early life. So does an authorized biography by Jonathan Daniels, The Man of Independence (Philadelphia, 1950), of much interest because Daniels talked with Truman family members and friends in Missouri a dozen years before the Truman Library's oral history program began. See also Alfred Steinberg, The Man from Missouri: The Life and Times of Harry S. Truman (New York, 1962), by an able freelancer. Cabell Phillips, The Truman Presidency: The History of a Triumphant Succession (New York, 1966), is by a New York Times reporter in Washington during Truman's presidency. Robert J. Donovan, Conflict and Crisis: The Presidency of Harry S. Truman, 1945–1948 (New York, 1977) and Tumultuous Years: The Presidency of Harry S. Truman, 1949–1953 (New York, 1982), are definitive accounts by a reporter for the New York Herald Tribune during the Truman years. A smaller book on the same subject is Donald R. McCoy, The Presidency of Harry S. Truman (Lawrence, Kans., 1984). 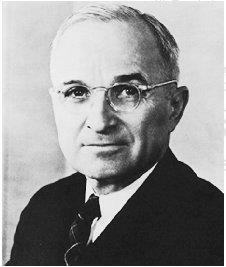 Harry S. Truman, Memoirs , vol. 1; Year of Decisions (Garden City, N.Y., 1955) and vol. 2, Years of Trial and Hope (Garden City, N.Y., 1956), constitute a huge analysis of the presidency, with a short narrative of the president's earlier years in the first volume. Francis H. Heller, "Harry S. Truman: The Writing of His Memoirs," in George Egerton, ed., Political Memoir: Essays on the Politics of Memory (London, 1994), is by Truman's principal assistant on the memoirs. Truman Speaks (New York, 1960) is a collection of lectures Truman gave at Columbia University in 1959; and Mr. Citizen (New York, 1960) covers his postpresidential years. Charles Robbins and Bradley Smith, Last of His Kind: An Informal Portrait of Harry S. Truman (New York, 1979), is based on interviews with Truman in Independence in 1953, after retirement. Margaret Truman, Harry S. Truman (New York, 1973), and her Bess W. Truman (New York, 1986), are of course personally biographical. Ken Hechler, Working with Truman: A Personal Memoir of the White House Years (New York, 1982), is by a White House staffer. Francis H. Heller, ed., The Korean War: A Twenty-Five-Year Perspective (Lawrence, Kans., 1977), The Truman White House: The Administration of the Presidency, 1945–1953 (Lawrence, Kans., 1980), and Economics and the Truman Administration (Lawrence, Kans., 1981), are reports of conferences of former administration officials and scholars held by the Truman Library. Robert Underhill, The Truman Persuasion (Ames, Iowa, 1981), is a study of the president's speechmaking but contains much information generally about the presidency. Franklin D. Mitchell, Harry S. Truman and the News Media: Contentious Relations, Belated Respect (Columbia, Mo., 1998), offers insight to some of the most frank press conferences in recent history. Monte M. Poen, Harry S. Truman versus the Medical Lobby: The Genesis of Medicare (Columbia, Mo., 1979), was another exercise in frankness. Andrew J. Dunar, The Truman Scandals and the Politics of Morality (Columbia, Mo., 1984), is excellent for its subject. Documents appear in Robert H. Ferrell, ed., Off the Record: The Private Papers of Harry S. Truman (New York, 1980), selected from letters, memoranda, and diary entries beginning in April 1945; The Autobiography of Harry S. Truman (Boulder, Colo., 1980), which draws together autobiographical fragments; and Dear Bess: The Letters from Harry to Bess Truman, 1910–1959 (New York, 1983), half of the cache of letters discovered in the Truman house after Mrs. Truman's death in 1982. See also Monte M. Poen, ed., Strictly Personal and Confidential: The Letters Harry Truman Never Mailed (Boston, 1982), letters Truman wrote and had second thoughts about mailing; and Truman's Letters Home (New York, 1984), another drawing on the remarkable resources of the Truman Library. Robert H. Ferrell, Truman: A Centenary Remembrance (New York, 1984), is biography and photographs; James N. Giglio and Greg G. Thielen, Truman in Cartoon and Caricature (Ames, Iowa, 1984), shows how its subject lent himself to caricature; and Richard S. Kirkendall, ed., The Harry S. Truman Encyclopedia (Boston, 1989), is indeed encyclopedic. Recent works include Steve Neal, Harry and Ike: The Partnership That Remade the Postwar World (New York, 2001) and Michael J. Hogan, A Cross of Iron: Harry S. Truman and the Origins of the National Security State, 1945–1954 (Cambridge and New York, 2000). The issue of Truman's relations with the political boss of Kansas City in the latter 1920s and 1930s appears in Lawrence H. Larsen and Nancy J. Hulston, Pendergast! (Columbia, Mo., 1997); and Robert H. Ferrell, Truman and Pendergast (Columbia, Mo., 1999); and Rudolph H. Hart-mann, The Kansas City Investigation: Pendergast's Downfall, 1938-1939 , edited by Ferrell (Columbia, Mo., 1999). On the 1948 election see Harold I. Gullan, The Upset That Wasn't: Harry S. Truman and the Crucial Election of 1948 (Chicago, 1998), and Zachary Karabell, The Last Campaign: How Harry Truman Won the 1948 Election (New York, 2000). A reprinting of books by or about President Truman, known by its piquant title, the Give 'Em Hell Harry series, begun in 1996, has again made available books mentioned above by Daniels, Donovan, Dunar, Ferrell, Hechler, and Poen, with more to come. I want use this article for research, how do I cite it to give proper credit? Excellent article. One of the best things I have read on the internet. Roosevelt, Franklin D. Eisenhower, Dwight D.